It's 756 feet long on each side, 450 feet high and is composed of 2,300,000 blocks of stone, each averaging 2 1/2 tons in weight. Despite the makers' limited surveying tools, no side is more than 8 inches different in length than another, and the whole structure is perfectly oriented to the points of the compass. Even in the 19th century, it was the tallest building in the world and, at the age of 4,500 years, it is the only one of the famous "Seven Wonders of the Ancient World" that still stands. Even today it remains the most massive building on Earth. It is the Great Pyramid of Khufu, at Giza, Egypt. Other: Tallest building in the world till 1311 AD and again from 1647 to 1874. Some of the earliest history of the Pyramid comes from a Greek the historian and traveler Herodotus of Halicanassus. He visited Egypt around 450 BC and included a description of the Great Pyramid in a history book he wrote. Herodotus was told by his Egyptian guides that it took twenty years for a force of 100,000 oppressed slaves to build the pyramid (with another 10 years to build a stone causeway that connected it to a temple in the valley below). Stones were lifted into position by the use of immense machines. The purpose of the structure, according to Herodotus's sources, was as a tomb for the Pharaoh Khufu (whom the Greeks referred to as Cheops). Herodotus, a Greek from the democratic city of Athens, probably found the idea of a single man employing such staggering wealth and effort on his tomb an incredible act of egotism. He reported that even thousands of years later the Egyptians still hated Khufu for the burden he had placed on the people and could hardly bring themselves to speak his name. The three large pyramids at Giza: From left to right, Menkaure, Khafre, Khufu. The far pyramid is the "Great Pyramid" and the largest structure on the site. The middle one may look larger, but only because it is built on higher ground. However, Khufu's contemporary Egyptian subjects may have seen the great pyramid in a different light. To them the pharaoh was not just a king, but a living god who linked their lives with those of the immortals. The pyramid, as an eternal tomb for the pharaoh's body, may have offered the people reassurance of his continuing influence with the gods. The pyramid wasn't just a symbol of regal power, but a visible link between earth and heaven. Indeed, many of the stories Herodotus relates to us are probably false. Engineers calculate that fewer men and less years were needed than Herodotus suggests to build the structure. It also seems unlikely that slaves or complicated machines were needed for the pyramid's construction. It isn't surprising that the Greek historian got it wrong, however. By the time he visited the site, the structure was already 20 centuries old, and much of the truth about it was shrouded in the mists of history. Certainly the idea that it was a tomb for a Pharaoh, though, seems in line with Egyptian practices. For many centuries before and after the construction of the Great Pyramid, the Egyptians had interned their dead Pharaoh-Kings, whom they believed to be living Gods, in intricate tombs. 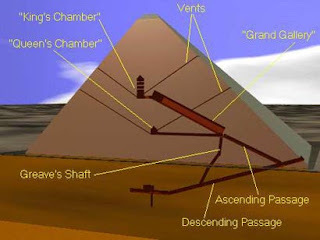 Some were above-ground structures, like the pyramid, others were cut in the rock underground. All the dead leaders were outfitted with the many things it was believed they would need in the afterlife to come. Many were buried with untold treasures. 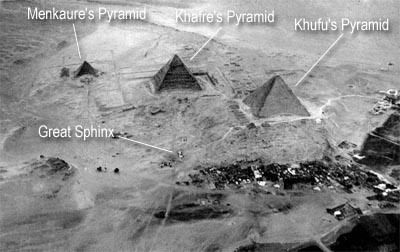 The Giza complex as it looked in 1904 from Eduard Spelterini's balloon. If we were to visit the location of the great pyramid when it was just finished, it would look very different than we see it today. 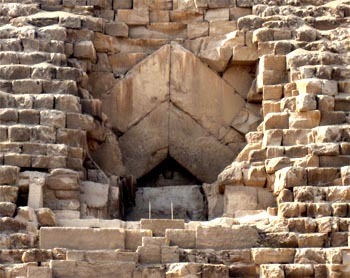 Originally, the pyramid itself was encased in highly polished white limestone with a smooth surface which is now gone. At the very top of the structure would have been a capstone, which is also now missing. Some sources suggest that the capstone might have been sheathed in gold. Between the white limestone and the golden cap the pyramid would have made an impressive sight shining in the bright Egyptian sun. Around the base of the great pyramid were four smaller pyramids, three of which still stand today. On the east side of the pyramid stood a now missing Funerary temple. Running down the hill into the valley was a stone causeway, which linked the Funerary temple with a temple in the valley. 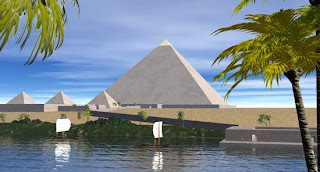 Around the pyramid were six boat shaped pits that may have contained the hulls of vessels that belonged to the pharaoh. Parts of one of these have been found and reconstructed into a 147 foot long boat that today is enclosed next to the pyramid in its own museum. The other two large pyramids at Giza, the Pyramid of Khafre (Khufu's son) and the Pyramid of Menkaure had not yet been built, so the Khufu's pyramid and its associated structures stood alone, though surrounded by the dwelling places and the graves of many of those that helped construct it. Even in ancient times, thieves breaking into the sacred burial places were a major problem and Egyptian architects became adept at designing solutions to this problem. They built passageways that could be plugged with impassable granite blocks; created secret, hidden rooms and made decoy chambers. No matter how clever the designers became, however, robbers seemed to be even smarter and with almost no exceptions, each of the great tombs of the Egyptian Kings was plundered. In 820 A.D. the Arab Caliph Abdullah Al Manum decided to make his own search for the treasure of Khufu. He gathered a gang of workmen and, unable to find the location of a reputed secret door, started burrowing into the side of the monument. After a hundred feet of hard going they were about to give up when they heard a heavy thud echo through the interior of the pyramid. Digging in the direction of the sound, they soon came upon a passageway that descended into the heart of the structure. On the floor lay a large block that had fallen from the ceiling, apparently causing the noise they had heard. Back at the beginning of the corridor they found the secret hinged door to the outside they had missed. Working their way down the passage they soon found themselves deep in the natural stone below the pyramid. The corridor stopped descending and went horizontal for about 50 feet, then ended in a blank wall. A pit extended downward from there for about 30 feet, but it was empty. When the workmen examined the fallen block they noticed a large granite plug above it. Cutting through the softer stone around it they found another passageway that extended up into the heart of the pyramid. As they followed this corridor upward, they found several more granite blocks closing off the tunnel. In each case they cut around them by burrowing through the softer limestone of the walls. Finally, they found themselves in a low, horizontal passage that led to a small, square, empty room. This became known as the "Queen's Chamber," though it seems unlikely that it ever served that function. The secret entrance missed by the Caliph's men when searching for treasure. (Courtesy Olaf Tausch and Wikipedia Creative Commons). Back at the junction of the ascending and descending passageways, the workers noticed an open space in the ceiling. Climbing up they found themselves in a high-roofed, ascending passageway. This became known as the "Grand Gallery." At the top of the gallery was a low, horizontal passage that led to a large room, some 34 feet long, 17 feet wide, and 19 feet high. It became known as the "King's Chamber." In the center was a huge granite sarcophagus without a lid. Otherwise the room was completely empty. The Arabs, as if in revenge for the missing treasure, stripped the pyramid of its fine white limestone casing and used it for building in Cairo. They even attempted to disassemble the great pyramid itself, but after removing the top 30 feet of stone, they gave up on this impossible task. So what happened to the treasure of King Khufu? Conventional wisdom says that, like so many other royal tombs, the pyramid was the victim of robbers in ancient times. If we believe the accounts of Manum's men, though, the granite plugs that blocked the passageways were still in place when they entered the tomb. How did the thieves get in and out? 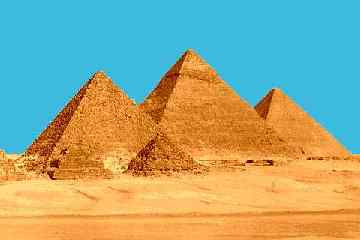 In 1638 an English mathematician, John Greaves, visited the pyramid. He discovered a narrow shaft, hidden in the wall that connected the Grand Gallery with the descending passage. Both ends were tightly sealed and the bottom was blocked with debris. Some archaeologists have suggested this route was used by the last of the Pharaoh's men to exit the tomb after the granite plugs had been put in place and by the thieves to get inside. Given the small size of the passageway and the amount of debris it seems unlikely that the massive amount of treasure, including the huge missing sarcophagus lid, could have been removed this way, however. Scientists have long argued about how this massive structure was built, but the most likely theory seems to be that the Egyptians built a huge ramp that allowed them to drag the blocks into position. Because a single straight ramp (as seen in the recent movie 10,000B.C.) would have to be over a half mile long to reach the top and would need to contain as much material as the pyramid itself, engineers have suggested that the ramp was in the shape of a spiral running around the outside of the pyramid. Alternately the Egyptians may have combined a straight ramp that ran part way up the pyramid with a spiral ramp to the very top levels. Blocks were probably dragged up the ramp by a team of men and put into their final position through the use of levers (For more information on the construction of the Great Pyramid, see our page How to Build a Pyramid). French architect Jean-Pierre Houdin advanced the theory that a spiral ramp was used on the inside of the pyramid to move the stone blocks. According to Houdin a straight external ramp was used to get materials to the 140 foot level. From there workers dragged the stones through a set of gently rising tunnels just inside the outer walls. The last tunnel would exit on the monument's top. A 1986 microgravity survey of the pyramid discovered a peculiar anomaly: a less-dense structure in the form of a spiral within the pyramid that may turn out to be what is left of Houdin's tunnels. 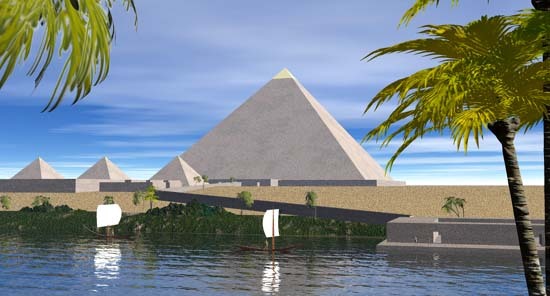 A project management group that studied the problem of building the Great Pyramid estimated that the project, using material and methods available at the time, might have required less than ten years to complete: Two or three years site preparation, five years of actual construction and two years to remove the ramps and put on the finishing touches. This could have been done with an average work force of less than 14,000 laborers and a peak force of 40,000. By examining the ruins of dwellings and workshops in the area, archeologists have estimated between 4,000 and 5,000 of these men were full-time workers committed to the project through most of the construction. Workers complete one of the smaller pyramids on the eastern side of the Great Pyramid (Copyright Lee Krystek, 1999). Egyptian records indicate that the laborers, while being drafted against their will, were actually well cared for by ancient standards. Regulations have been found covering the maximum amount of work allowed per day, the wages received and holidays each worker was entitled to. Also, by scheduling most of the work to be done during annual flood periods, the Pharaoh could get a lot done without impacting the normal Egyptian economy. Was the Pyramid a Tomb? Some have suggested that the pyramid was never meant as a tomb, but as an astronomical observatory. The Roman author Proclus, in fact, states that before the pyramid was completed it did serve in this function. We can't put too much weight on Proclus words, though, remembering that when he advanced his theory the pyramid was already over 2000 years old. Richard Proctor, an astronomer, did observe that the descending passage could have been used to observe the transits of certain stars. He also suggested that the grand gallery, when open at the top during construction, could have been used for mapping the sky. 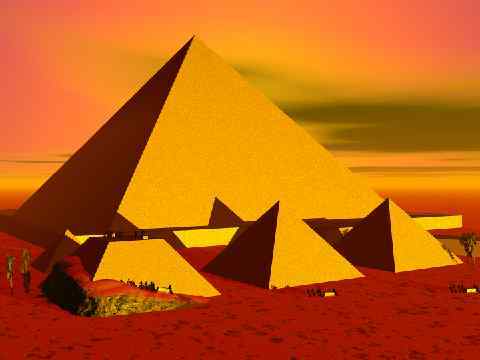 Many strange (and some silly) theories have arisen over the years to explain the pyramid and its passageways. 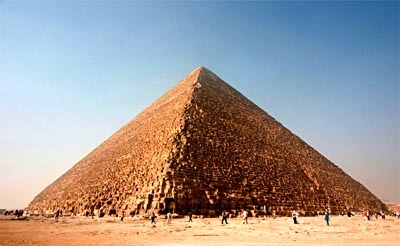 Most archaeologists, however, accept the theory that the great pyramid was just the largest of a tradition of tombs used for the Pharaohs of Egypt. So what happened to Khufu's mummy and treasure? Nobody knows. Extensive explorations have found no other chambers or passageways. Still one must wonder if, perhaps in this one case, the King and his architects outsmarted both the ancient thieves and modern archaeologists and that somewhere in, or below, the last wonder of the ancient world, rests Khufu and his sacred gold. 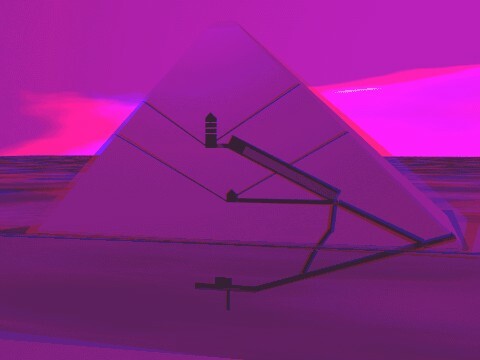 0 Komentar untuk "history of pyramid"